Back to School: are you spiritually ready? Preparation is a concept we totally understand. Parents have been preparing their children to go back to school. We get the school materials list and we go after all those items. We find the best sales and we buy them new uniforms. We make sure their lunch boxes are in place to hold the nutrition that will help their growing brains make the most out of the influx of information that’s about to come. We get preparation and we do prepare for what’s to come in the natural. 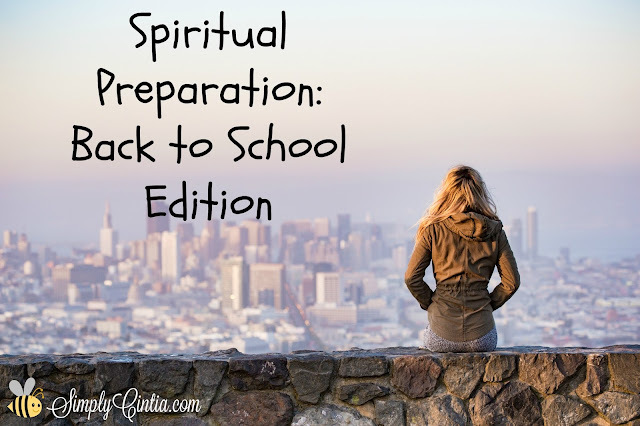 Our spiritual life also requires preparation. Unfortunately, there isn’t a list of spiritual traits I need to invest on so that when I’m faced with challenging situations I will thrive. So I pray. I don’t pray to become an olympic, gold medalist in the prayer category but I pray because I simply depend on my God. Every time I read my Bible, whether little or a lot, I am preparing my heart with the knowledge of the Holy. The more I know God, the more I realize I can depend on Him. I also see this type of preparation as a big investment in my relationship with God. I hope to have the type of relationship that’s not need based. Meaning, I only pray to God when I need stuff. I hope to have a relationship that’s based on love, devotion and pure fascination. This fascination doesn’t come through someone else’s filter (such as the ones we heavily hear in the media or read in books) but I get to make my own intellectual decision about God. He did say I should love Him with my mind, so I use my mind often. This summer break is almost over so instead of filling you with more stuff to do (I know we all have more than enough on our plates), I’m challenging you to cultivate a sense of wonder. I am encouraging you not to lose your sense of wonder towards your God. There’s more to be discovered, experienced and He wants to be known. Will you take time today to prepare your heart as you devote yourself towards God?